From incredible Olympic moments and Super Bowl Sunday to Little League snack schedules and undying fans, sporting traditions in the United States have long been an important part of American culture. Athletes often use the word “love” to describe their passion, and many spend entire lifetimes giving to sports they love — first as players, then as coaches, mentors or spectators. But when this love of sport fades, athletes are forced to think about their goals and changing selves and are faced with reconciling new identities. Maia Joiner, ’20, has played basketball since she was in kindergarten. She played the game with her brothers in her backyard and by the time she was in middle school, she had played in several organized leagues. Joiner’s initial passion for playing basketball was replaced with a passion for track and field at Vincentian High School in Pittsburgh, and she said her goal was to be able to attend college without paying full-price. 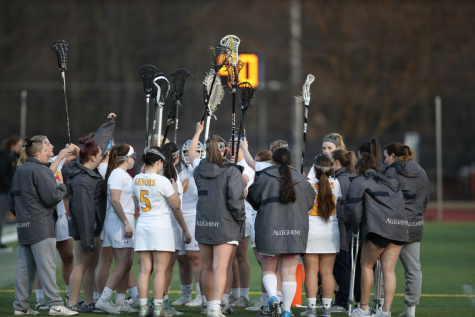 An ankle injury Joiner received her junior year of high school extinguished her hope of attending college as a track and field athlete, so she returned to her first passion and was recruited to play for the Allegheny Women’s Basketball Team. Joiner entered her first Gator season in 2016 but was unable to fully perform as she was recovering from a summer surgery to address her ankle injury suffered in her junior season. After spending some time on the bench in recovery her first season, becoming perceptive to the team’s lack of chemistry and suffering her sixth concussion during her sophomore season in November, Joiner said she knew it was time to step away. Joiner decided to leave the team at the end of the season this semester and said she likes to use a critical scene in the 1992 Walt Disney movie “Aladdin” to explain how she felt. Although she has loved and played basketball since her early backyard years, Joiner said she felt pressured to play in college and follow a conventional athletic path. Combining her injury history, which included six concussions with what she described as “tension” on the team, Joiner said she prioritized her health and no longer felt obligated to play. When Joiner approached Head Coach Kate Costanzo about leaving the team, Joiner said she did not think Costanzo was fully sensitive to her reasons for retiring. During the 2016-17 and 2017-18 seasons, the women’s basketball roster lost other names as well. Candaisy Crawford, ’19, said she believes many former players have decided to retire within the last two seasons because they have been frustrated with the college’s program and coaching staff. The former guard decided to leave the team just before winter break in 2017. “The main part of it being hard is that I still had so much to give, but it just wasn’t going to be beneficial for me,” Crawford said. Crawford expressed concerns about Costanzo’s style of play and position assignments and said she thinks many players were not assigned positions that suited them or the skills for which they were initially recruited. Crawford and Emily Smith, ’19, both said they thought the teams of their two full seasons did not lack talent, but that they were not given opportunities to showcase their talent and reach their full potential because of Costanzo’s coaching style and the annual turnover of assistant coaches in the last three years. Smith, who left the team mid-season this semester, said the team has had a new assistant coach each year since her first year in the fall of 2015. Steven Harney, who served as the women’s basketball assistant coach for the 2014-15 and 2015-16 seasons, was dedicated to the recruiting process, according to Smith. Gabby Holko then served as assistant coach for the 2016-17 season until Rianne Thornton was announced as the new assistant coach in 2017. Talking to family members and teammates helped Smith make her final decision this season, but Smith said she did not feel comfortable talking to the coaching staff about how she really felt. Costanzo has been coaching basketball for 12 years, 11 of which have been at Allegheny. Losing players is a reality for any team, and coaches try to plan for those losses during recruitment, Costanzo said. As a member of the women’s basketball team during her time as a student at Pennsylvania State Behrend University, Constanzo said she experienced her share of student athlete frustrations. Both Crawford and Smith said they do not anticipate returning to play Allegheny basketball but would consider a return if player input were to become a more significant part of team strategies. “I still want to be playing basketball, I just don’t think that at Allegheny it’s the best environment to do so,” Smith said. For Joiner, her experiences have enabled her to fall out of love with the sport and readjust to a life without collegiate basketball.